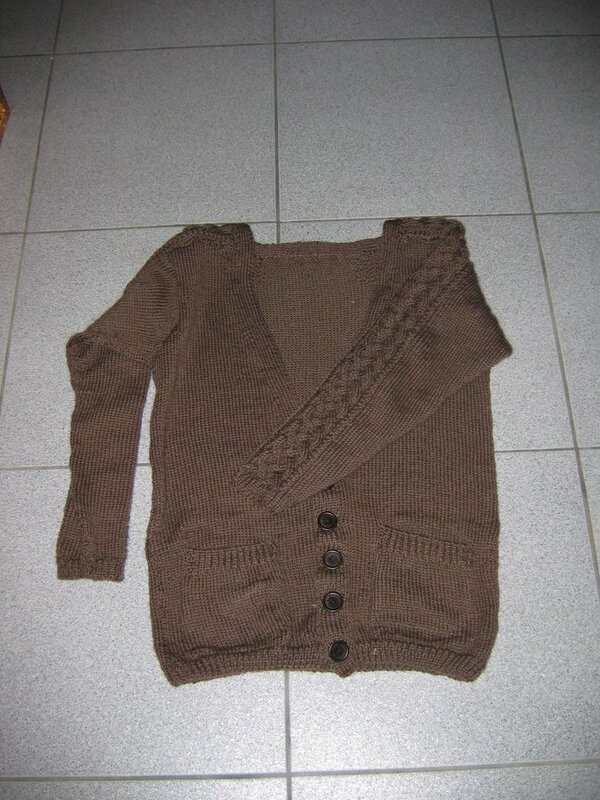 Em's Knitty Corner: The big one! Yep, I have been knitting, but not as much as I would want to. There are a few projects to show off though. I don't even remember which ones I already showed, and which I didn't show just yet. 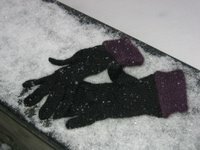 The Alpaca Gloves from Knitscene. 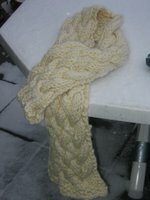 I did use different yarn then in the project, but it turned out lovely! Shawl knitted out of pure wool, matched the nice white hat I knitted just before we left. I used a random cable pattern. This shawl is HUGE and super warm, I love it! That's it! I didn't get to visit any yarn stores in Germany :(. Boyfriend wanted to go skiing, and when we returned the weather was so bad it seemed better to me to just keep on going till we were home instead of making a stop on the way for a yarn store. There wasn't a yarn store in the little town we were staying at, though I found some lovely sock yarn (Regia and some less know) in the local supermarket! Looking forward to knitting it all up. 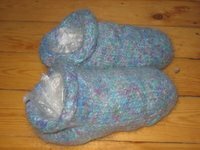 Yep, these are the Fuzzyfeet ! 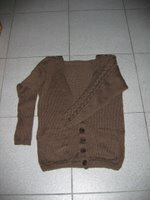 One strand of 100% pure wool (store-bought), one strand of 100% mohair, and one strand of glittery thread. They turned out really nice! They needed 2 washings though, to get felted well. 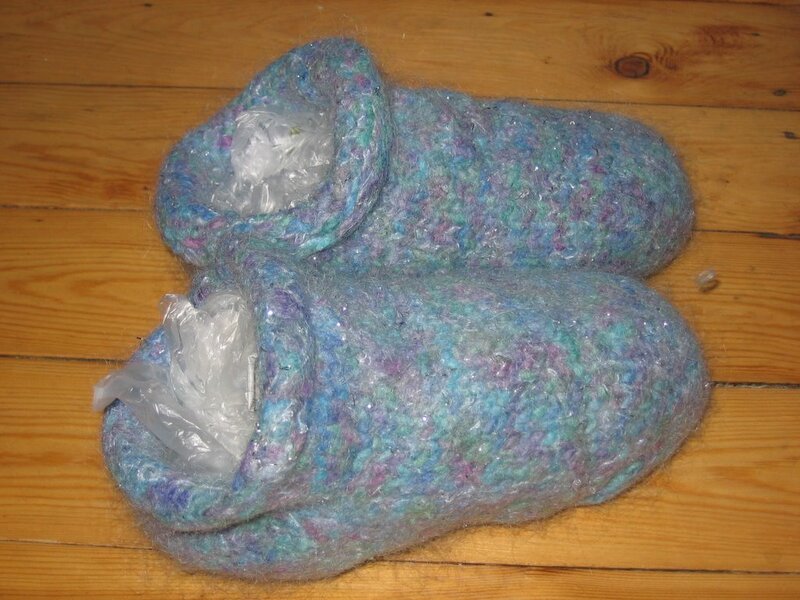 But I knitted them in one evening! They were for my aunt who's really happy with them. 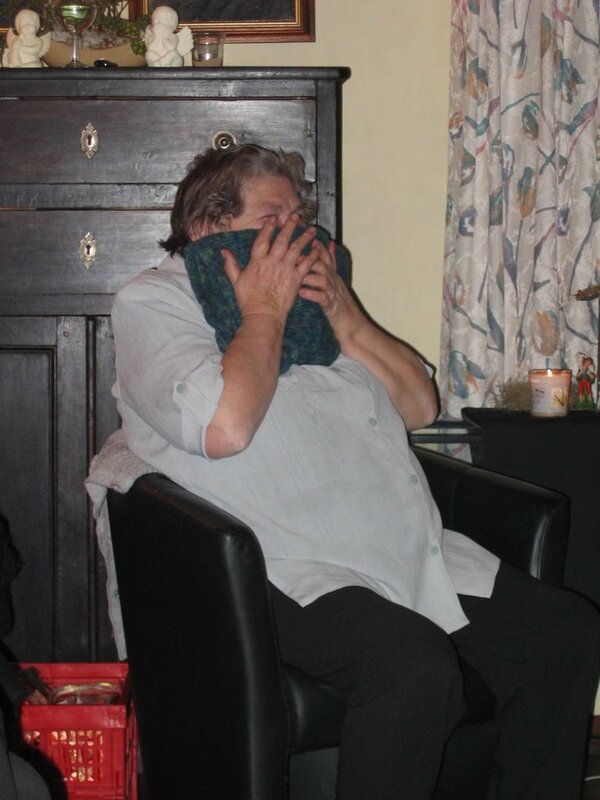 This is my grandma with the felted bag I gave her on New Years Eve. Sorry, I don't have a better picture. 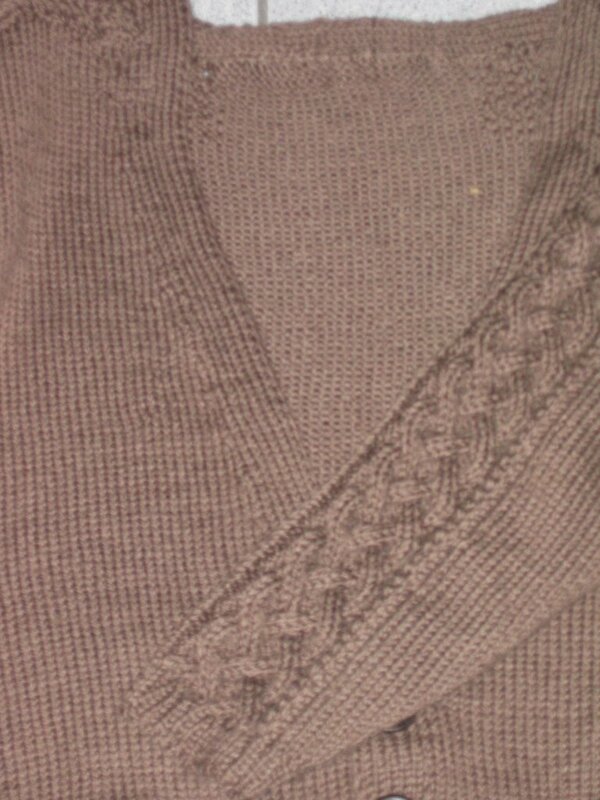 Same wool of above though in another colour, and I used the Sophie Bag pattern. I would have gave it one more trip through the washer if I had the time though. But my grandma loved it. I'm going to knit one for myself as soon as I get the time! 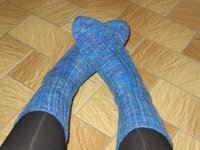 The pair of blue socks actually is my first FO of 2006! 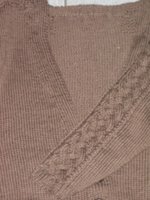 It's the Conwy pattern from Knitting on the Road from Nancy Bush. With my own handpainted 100% merino. 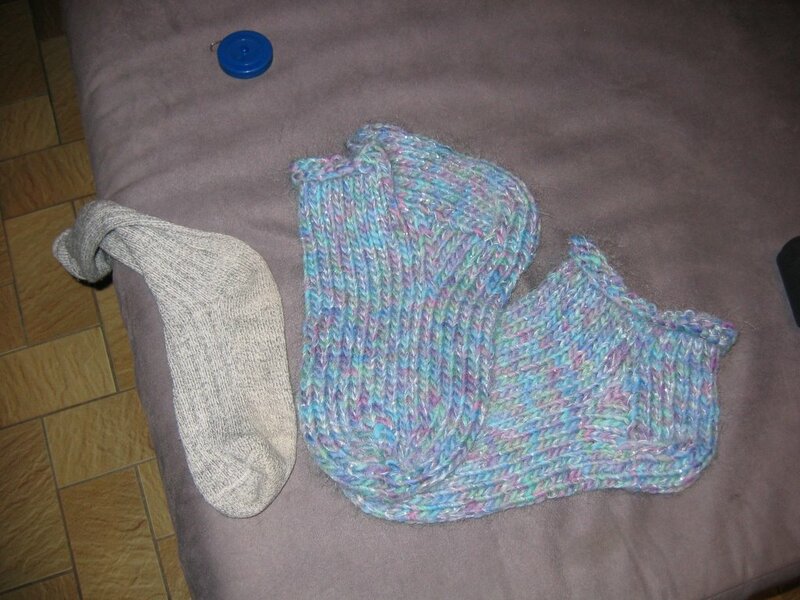 The other Sock is in Regia, mate need to be knitted. I used 2mm needles and made the leg a bit to big, so it'll be slouchy socks, but that's ok! These actually are my movie socks (I knit on them in the cinema!). So I'll be also joining the 200Socks by RoseByAny! 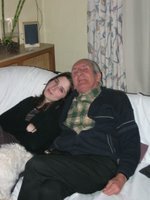 More about that in a following post! That's it for now I think! 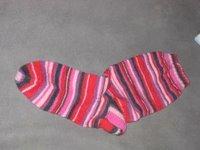 I'm working on a various amount of socks, and have plenty ideas for posts. I'm planning on taking up posting more often, keep reading please! I'll also try to make this blog look better over the weekend, but it'll be a very, very busy weekend for me with lots of therapy on Saturday (me giving hippotherapy that is) and a jumping competition on Sunday, and lots of sleep in between 'cause I'm really extremely tired these days! Oh, and Rox! I started on the Second of the SET socks! I'll let you know when they are done! Donni, haven't forgotten about you! Soon you'll have a pair of socks! Yay! I was only beginning to despair a little tiny bit - but always held out hope of my first real fair isle socks - so exciting.